Try our homemade enchilada sauce for this recipe! Click here for the enchilada sauce recipe. Preheat Oven to 375°F (190°C). Oil a sheet pan with olive oil. Carefully cut spaghetti squash in half lengthwise. Scoop out the seeds and connecting strands, then place cut side down on the prepared sheet pan. Bake for 45 minutes, or until the squash flesh becomes tender and separates easily into strands with a fork. Finish by gently loosening the "spaghetti strands" from the shells. While squash is baking, make the chicken enchilada mixture: In bowl, combine the chicken, enchilada sauce, garlic salt and onion powder and 3/4 cup of the cheddar cheese. 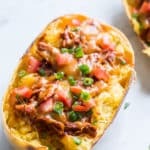 When squash is cooked and you’ve loosened the strands, divide the chicken enchilada mixture between the two spaghetti squash “boats”. Top the squash with the remaining 1/4 cup of cheese. Bake oven for about 10 minutes or until the squash, sauce and chicken is warm and cheese is melted. If you want the cheese bubbly and brown, broil the squash for an additional minute or so. Top with green onions and optional toppings. Serve warm. Enjoy!